Governor Scott’s water managers to be lampooned as beholden to Sugar Daddies. Protest: 8:30 a.m. to 12 Noon. 3301 Gun Club Road, West Palm Beach, Florida, 33406, outside the main entrance. What: Protest to Buy Sugar Land NOW! 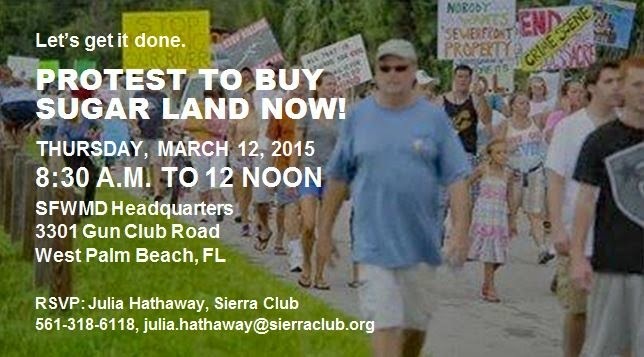 More than a hundred residents from Central, Southwest and Southeast Florida will protest Governor Rick Scott and his appointed water managers outside the South Florida Water Management District headquarters for failing to acquire 48,600 acres of US Sugar land to restore the Everglades and protect the coasts from pollution. The state of Florida has an option to purchase by October, but water managers must take action now for the process to begin and Amendment One funds to be used. According to the University of Florida, the land purchase must be considered to stop marine life die-offs in the Caloosahatchee and St. Lucie River basins and along the Indian River Lagoon. **VISUALS** A Sugar Daddy dressed in costume buying off water managers with fake money and protesters with signs and solidarity fish. Why: The South Florida Water Management District and the U.S. Army Corps of Engineers are dumping about a half billion gallons of highly polluted fresh water a day into the St. Lucie and Caloosahatchee rivers, polluting critical marine habitats and harming communities. Residents are incredulous that Governor Scott and his appointees will not consider the 48,600 acre purchase option in the US Sugar contract in spite of algal blooms and massive marine die offs that occurred in Indian River Lagoon in 2013 and are now threatening. As polluted water is dumped to the coasts, the Everglades subject of a multibillion restoration project, is starving for water. The solution, according to University of Florida scientists, is to pursue 48,600 acres of sugar land to store and clean the water. Governing board members have largely ignored those pleas and appear intent to allow Big Sugar to walk out of a deal and let restoration evaporate forever.